The Drexel University men’s basketball team hosted Towson University Jan. 17. Throughout multiple points in the game, the Dragons found themselves playing catch up. In the first half the Dragons went down by 11 only to then have a 13-3 run of their own to get within one point of Towson. For the rest of the first half, the Dragons kept it close being only down 35-34. The Dragons first half comeback was led by junior Alihan Demir who had 11 points. The Drexel students filled the bleachers, and the crowd definitely played a big part in the Dragons’ comeback. Drexel went down once again in the second half as Towson had an 11 point lead with 13 minutes remaining after going on a 19-5 run. Sophomore Jarvis Doles and the Dragons didn’t let this lead last for long as he scored 13 straight points. Doles served as a catalyst for Drexel’s 18-2 run which resulted in the Dragons taking a six-point lead with just under four minutes to play. Drexel wound up closing the game out and winning by a final of 72-66. Demir led all scorers with 22 points to go along with a career-high 16 rebounds. The hero Doles finished the game with a career-high 16 points. In Drexel’s next game they hosted James Madison University Jan.19. Like the previous game, Drexel had to win by doing their signature move, which is coming back from large deficits. James Madison started off the game hot early going on a 20-4 run. A big reason for the lead was that the Dukes went 4-4 from the three-point line. Despite being down by a lot early on in the game, Drexel was able to keep themselves in the game by getting to the free throw line as they went 10-14 from the charity stripe in the first half. Drexel would then go on a pair of scoring runs thanks to points by senior Troy Harper and graduate transfer Trevor John. Harper’s layup with under two minutes left in the first half gave the Dragons their first lead, and they never looked back. The Dragons went on to the second half and never trailed in the game again. They continued to produce offensively in the second half and were up by as many as 12 points. James Madison was able to make a comeback of their own led by redshirt junior Stuckey Mosley who had 25 points on the day. Despite the comeback attempt, the Dragons were able to come up with the win beating James Madison 73-68. The Dragon comeback is the fifth time this year the Dragons have come back to win by being down at least 10 points. Harper finished the game with 22 points as he continues to produce for the Dragons in his final season. Freshman Camren Wynter was also impressive in the victory filling up the stat sheet with 14 points, five rebounds and four assists. 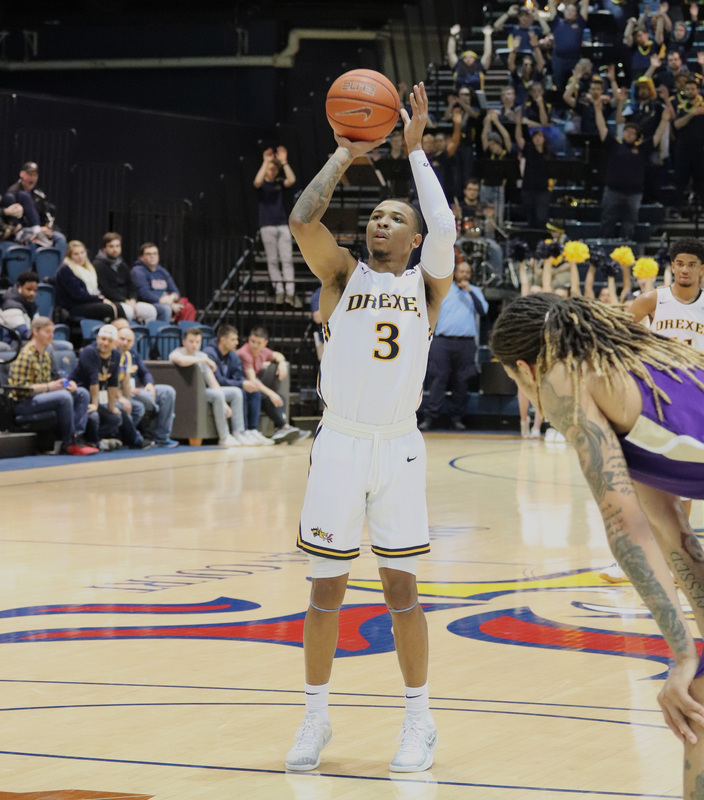 The homecoming victory gives Drexel a record of 10-11 overall and 4-4 in Colonial Athletic Association conference play, which puts the Dragons in fourth place. Drexel will now be on a three-game road trip starting with the University of Delaware Jan. 26.